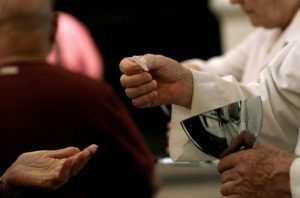 Communion can be brought to the sick or housebound. Please contact the parish office to arrange this for yourself or a member of the parish community. Children usually make their First Holy Communion in second class in Primary School, but older children and adults who have been baptised can also receive the sacrament. Special arrangements are made for adult and teen preparation, please contact the Parish office for more details. For information on the “Do This In Memory of Me” First Eucharist Programme, please click here.